This article originally appeared in the July 2018 issue of the Nashville Arts Magazine. Under the leadership of Dr. Dru Davison, Fine Arts Advisor with Shelby County Schools, a team of teachers from across the state worked for two years to write and review academic standards for dance, media arts, music, theater, and visual arts. The new learning targets present a sizable shift in the delivery of course content in all arts disciplines and how students are expected to show mastery and understanding. This update represents the first significant change in structure and content in several years. The vision for the writing and review teams came from several sources, namely the National Core Arts Standards (NCAS), a first-of-its- kind set of national arts standards published in 2014. The standards were written to source the unique learning conditions and outcomes for each arts discipline and to provide a vision for lifelong learning. In revising the Tennessee standards, the writing and review teams sought to take the best parts of the NCAS and combine them with the knowledge and experience of Tennessee teachers to construct a more balanced approach to skills and concepts and to provide context on how and when arts content should be taught and assessed. For example, a current standard for K–5 elementary general music, “Students will sing alone, and with others, a varied repertoire of music,” now appears as “sing, alone and with others, with expression, technical accuracy, and appropriate interpretation.” The new learning goal requires students and teachers to consider the conditions and context of learning and provides criteria that may be used to assess mastery of the standard. Similar shifts are present for dance, media arts, theater, and visual arts. The writing team organized the standards under four domains and eleven foundations common to all arts disciplines. While there are commonalities between the disciplines, flexibility was provided to allow teachers to highlight the most critical aspects of their respective art forms. An example is in visual arts, where the Create domain is the dominant domain. In all other disciplines, Perform and Produce are the primary forms of artistic expression. In June 2018, the Tennessee Department of Education conducted standards training sessions in eleven sites across the state. This training marked the first time the TDOE offered state-level training for fine-arts teachers. 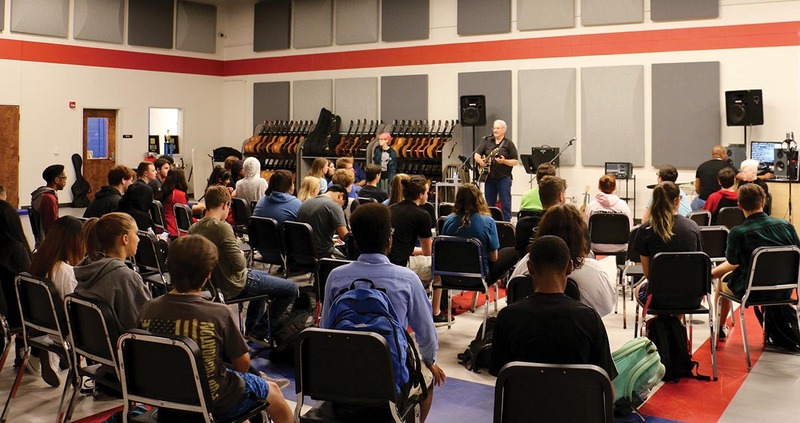 All training materials and training sessions were written and led by current Tennessee fine-arts teachers, and all training resources and materials are available on the TDOE website. To access the standards, please visit the Tennessee Department of Education website at www.tn.gov/education.